At the Guide Awards, Sobhita was seen in an Amit Aggarwal maxi, one that she wore with a bold red lip. Kudos for not only opting an Indian label but picking a silhouette different than the usual fare. I, for one, loved. Did you? At the Awards last evening, Kriti was photographed in an Amit Aggarwal gown. A sleek ponytail and statement earrings rounded out her look. Like what you see? 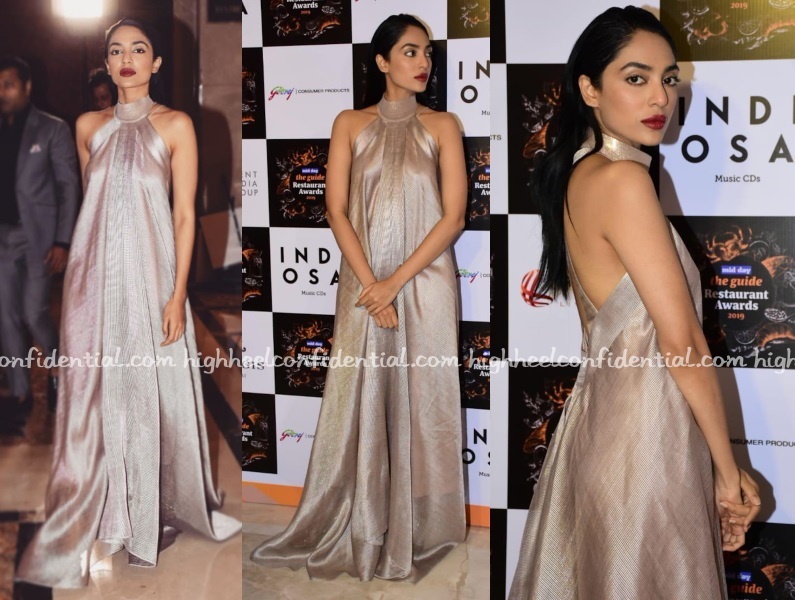 Wearing an Amit Aggarwal dress, Dia attended a wedding reception in Mumbai last evening. With her hair pulled back in to a ponytail, she rounded out the look with black accessories and jewelry by Mirari. The heavy-handed make-up wasn’t the only issue with the look. Neither length of her dress, nor its styling (those earrings!) worked for Ms. Mirza. This was one of those rare misses for her.